This map comes from an anthology called 'The Theatre of the Empire of Great Britaine', one of the most popular cartographic works in history. 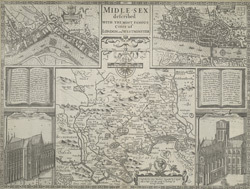 Speed, the cartographer, owed much of his success to the mapwork of Christopher Saxton and John Norden during the reign of Elizabeth I. Speed's maps differ from earlier examples in that they include detailed town plans (recording boundaries), and feature detailed accompanying text. Speed's draught material was taken to Amsterdam and engraved by Jodocus Hondius. The plates were then returned to Britain and the maps printed. 'The Theatre' was reprinted many times, latterly by C. Dicey and Co.